Everywhere I look these days, I seem to be reminded of gardening in the 1970's. The other day when I arrived for Thanksgiving at my older sister's house, my youngest sister opened the passenger side door of my car and threw in a bag of old gardening books from the 70's. It all happened so fast. I think she was waiting for me to pull up. I think she plotted it out. I think she practiced. Her motion of opening the door and throwing the books in was so fluid, so quick. She didn't want these gardening books so they are mine now, whether I want them or not. I feel like one of those eccentric cat ladies who ends up with all kinds of cats because everyone knows she loves cats, and so they drop off kittens and cats on her door step. She really has no choice but to take the cats in. She can't leave them starving out in the cold, can she? I can't leave these gardening books out in the cold, can I? They might end up in a trash pile or on a conveyer belt headed to a shredder. Shudder at the thought. It's kind of ironic that my sister forced me to take gave me these gardening books from the 70's because lately every time I see the spider plant (Chlorophytum elatum) in my sun room, I have been thinking about gardening in the 1970's. Does any plant other than the spider plant more represent house plants of the 1970's? I just need a hand made macrame' plant hanger and I'm all set. This pile of books my sister gave me includes the classic Wyman's Garden Encyclopedia by Donald Wyman (New York: The Macmillan Company, 1971). I already own four other books by Donald Wyman, which I bought new back in the day as reference books when I was in college studying horticulture. Now I'm considering buying good used copies of two other books he wrote that I don't have. Then I would have all seven of the books he wrote. Would you like to know what Wyman wrote about spider plants in his encyclopedia? "A common and very popular house plant native to South Africa, with fleshy tuberous roots, long, narrow, white-striped leaves all originating from the base of the plant and about a foot long. The plant sends out long stalks on which there are a series of plantlets, each well supplied with roots and leaves so that propagation from these is extremely simple. A rugged house plant which can thrive under neglect, it is excellent in hanging baskets in sun or shade." I think I'm going to enjoy spending some time this winter reminiscing about gardening in the 1970's, compliments of Wyman and many other authors. I've seen a number of ornamental cabbages in the last year or so and have been thinking about gardening in the '80s. I think you are right about the spider plant and the 70's. Not fond of macrame but go for it if you like it. I have a couple of older gardening books. I will have to go look for them. I just this week started a new Pinterest board on macrame. I did a lot of it in the, oddly enough, 70s and am thinking about making a plant hanger or two. I had a friend whose husband couldn't bear to compost the spider plant babies. Their house was FILLED with spider plants. In defense of C. elatum, I've found them excellent plants for outdoor containers. The habit makes them a good filler and the variegated leaves pick up the light. I still have my handmade macrame plant holder, no spider plant in it, the Christmas cactus that has just died, I must get a replacement! 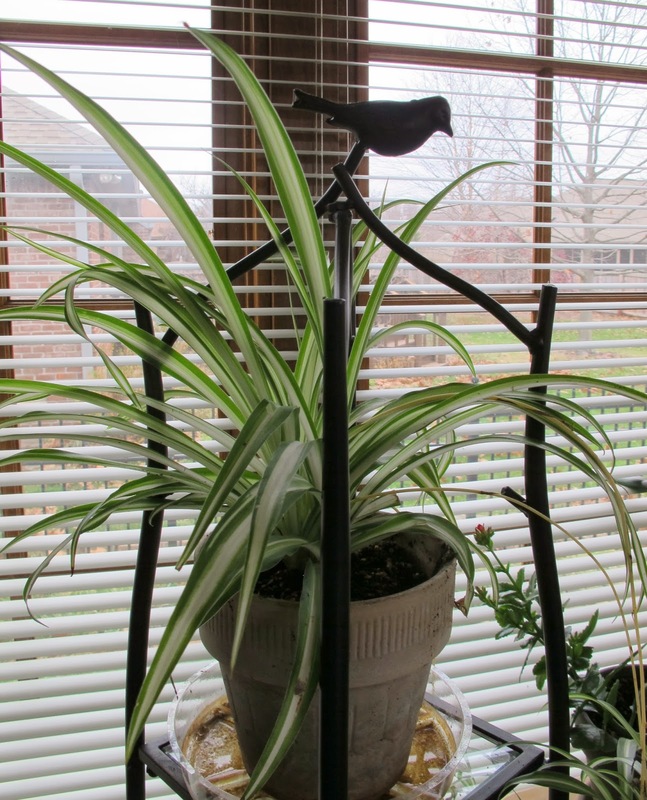 Besides the spiderplant, my 1970's plant collection included the prayer plant, wandering jew, and a very large philodendron that is still managing to stay alive in my mother's solarium. When Jenny and I were writing our book, "Indoor Plant Decor," we visited a number of nurseries. One was Young's Greenhouse in Ft. Wayne, and they had some small prayer plants. I was at once taken back to my apartment in my college days (1975) and the prayer plant I had bought at Frank's. Of course, I had to buy one. You should see it now. It's at least five times as big and has even bloomed. Every time I look at it, I think back to those fun days of the '70s. Now you've sent me on a way-back trip. Along with Spider Plants, I believe I had (and killed, from time to time) Creeping Charlies (Glechoma hederacea), Wandering Jews (Zebrina pendula) and Pothos (Epipremnum aureum). Interesting that they're all hanging plants. I guess that's what the macrame was for. 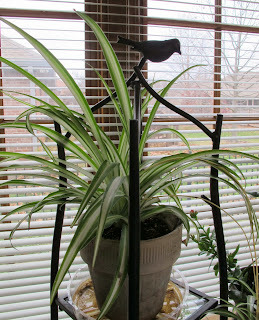 I definitely had a spider plant in a macramé hanger in the 70's. We got a spider plant a few months ago, because I wanted my daughter to remember having one. I always loved the babies!